This card started life as experimentation with my new pot of Silver Embossing Paste (available on 3 January in the new Occasions Catalogue). 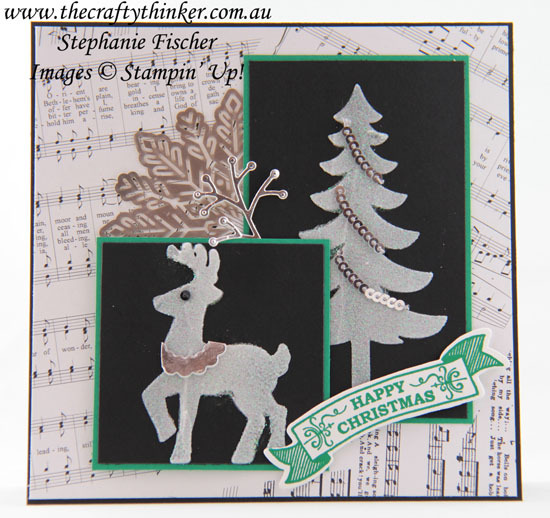 I cut Window Sheet stencils with dies in the Card Front Builder set. Not very happy with my silver results, I repeated the process (using the same stencils) with the Shimmery White Embossing Paste to check the differences. The Silver Embossing Paste is much runnier than either of the other two pastes and for this reason, I had less control of the paste and it kept squeezing its way under the stencil - to disastrous effect (as you'll see the photo below). I then tried out the Silver paste with one of the Pattern Party Decorative Masks and had a much better result - perhaps because those stencils are little thicker and sturdier than my home made one and also have smaller "open" areas. I used that test in this card. 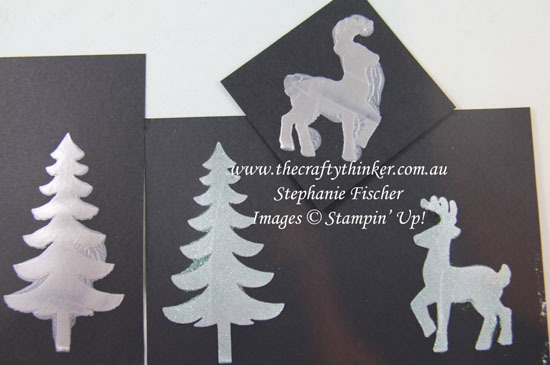 When I used the Shimmery White Embossing Paste with my home made stencils, the seepage was very limited and easy to clean up. There were originally smudged areas on the reindeer in the corner between the head and horns, between the hind legs and near the stomach. They looked very much like the area on the left of the tree. Before the paste was completely dry, I gently scraped away the offending bits with the end of my Paper-Piercing tool and then finished the cleaning process with a barely damp small brush. PS I wish you all the joys of the season!